As the U.S. endures its worst drought in over fifty years, farmers are actively seeking out boom sprayers in order to enhance their crop yields. It is no surprise then, that a number of irrigation companies are in fact reaping the benefits of the drought, as the demand for their products has increased substantially. Smart irrigation systems that allow users to program the boom sprayers to switch on at particular times, are controllable from a remote location, use water only where required, and subsequently conserve water are proving particularly popular. And all the proof is there, from university studies through to statistics from the U.S. Department of Agriculture, that these smart irrigation systems and boom sprayers indeed increase crop yields. While irrigation systems typically cost $45,000 to $50,000, the long term benefits of installing such systems far outweigh these initial costs. With so many irrigation companies out there, determining who offers high quality, functional boom sprayers that best suit individual requirements can be quite challenging. Comprised of durable, stainless steel bolts, nuts, motorised ball valve taps and hose clamps, Accuspray boom sprayers from Middle East Engineering are incredibly long-lasting, and they boast a triple filtration system. Sonic Boomsprays prides itself on the manufacture of extremely safe boom sprayers, and as such the company’s 5036TM model features safety locks on its lift rams, a main tank site gauge and boom arms that protect the jets. 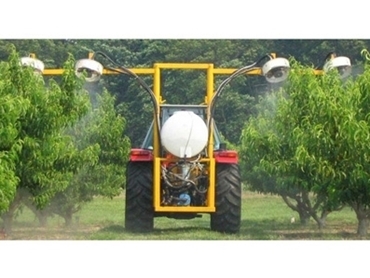 Customers are spoilt for choice when they purchase rotary atomiser boom spraysers from ColdMist Cooling Australia , as they are available in either hydraulic or electric versions. The boom sprayers are nozzle free, meaning they are clog proof and unaffected by wear, which minimises maintenance costs. Combine this with the fact that the boom sprayers offer a consistent spray pattern, and crops are guaranteed to receive an adequate supply of water at all times.